A stroll or a walk through city streets tells the story. It can speak of the culture and the cuisine. It can provide clues about the past and even point to the future. Yes, the walk allows a visitor to survey the scene and learn about the locals. 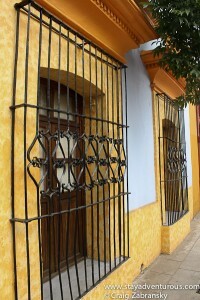 On my first free day in Oaxaca I walked the city streets and finally began to appreciate Oaxaca. I discovered charming buildings, a romantic vibe, and had safe passage at all hours. The charm initiates from its colorful colonial architecture. 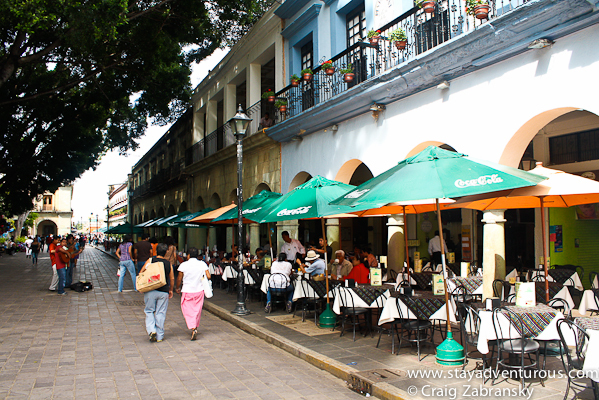 The plazas, marketplace, and countless churches create an delightful downtown. Perfect places for the perfect picture too. One vantage point seems better than the next in this UNESCO World Heritage site. Building after building, street after street, visitors might believe they traveled back to a simpler age if not for the traffic lights and cars. And after I walked through the streets and the main Zocalo I stumbled upon one of the city’s more impressive buildings, the Regional Museum of Oaxaca located in the ex-Convent of Santo Domingo. It is worth the fifty-one peso price entrance fee (free for locals). The visit put the exclamation point on my wanderings. A love exists on the streets of Oaxaca. I’d even call it a romance, well perhaps I have a romance with it. After church service on Sunday the streets fill with families and friends. It’s a weekly fiesta and a reason I cherish my travels to Mexico and loved Oaxaca. The food carts have lines twenty deep for Esquites or other snacks, kids play with old and new friends as adults discuss the latest “chisma” (gossip). The city’s plazas are packed with people. Happy people. The young adults peel off to find more quiet places to spend time with their significant others. For hours they talk, kiss, and seem to remain content just in each other’s company. It’s a joy to witness. These strong family and romantic relationship bonds are always evident in Mexico, but on a Sunday stroll through Oaxaca you feel them. It’s intense. Suddenly, you miss your family and your significant other. You yearn for that closeness. A closeness that seems so simple in Oaxaca. 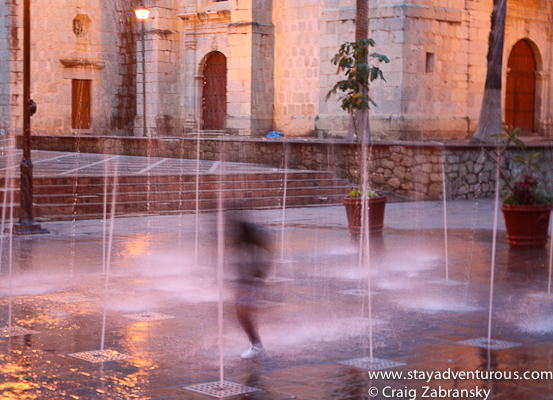 a child runs through the fountains.. But, are the streets of Oaxaca Safe? Statistically you are safer than many American cities. And as for me, there was never an issue or reason for concern. I walked at all hours and in all directions. I even asked for assistance a few times and tested my Spanish skills instead of my map reading ones. Everyone was more than helpful. I also walked on more occasions than my Sunday afternoon stroll. I visited the market one weekday morning, walked home after closing a bar at 5am and another night after a few Mezcals toasts with a friend. All walks without incident, all without even a worry. It’s very safe. the Zocalo, a perfect place in the day and also at night. So, yes, walking the city makes you learn the city. 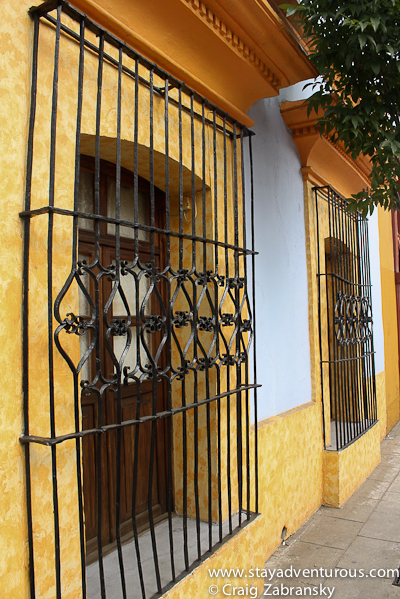 And in Oaxaca there is no better way to begin to appreciate its charm. this post is part of the my involvement as an ambassador in Mexico Today initiative. Although Mexico Today provided passage to Oaxaca, I walked the streets with my own agenda and on my own time. 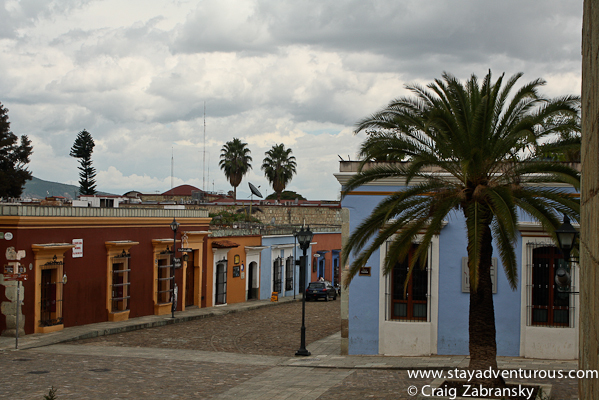 I can stroll the streets of Oaxaca all day…aimlessly. @Ana, you really can, it is such a wonderful city to walk about. And I have no doubt you saw the same couple, I think they were there all day. Oaxaca looks and sounds amazing.. my kind of place. I’ll be adding it to my ever-growing list of places to visit in Mexico! Wendy, definitely add Oaxaca, i really believe it is a must for those who truly appreciate Mexico. Viva! Great colorful pictures. Looks like a very quaint city. Loved the article. A very quaint, colorful city indeed. Thanks, i appreciate your comment too. I totally agree… I love it too.